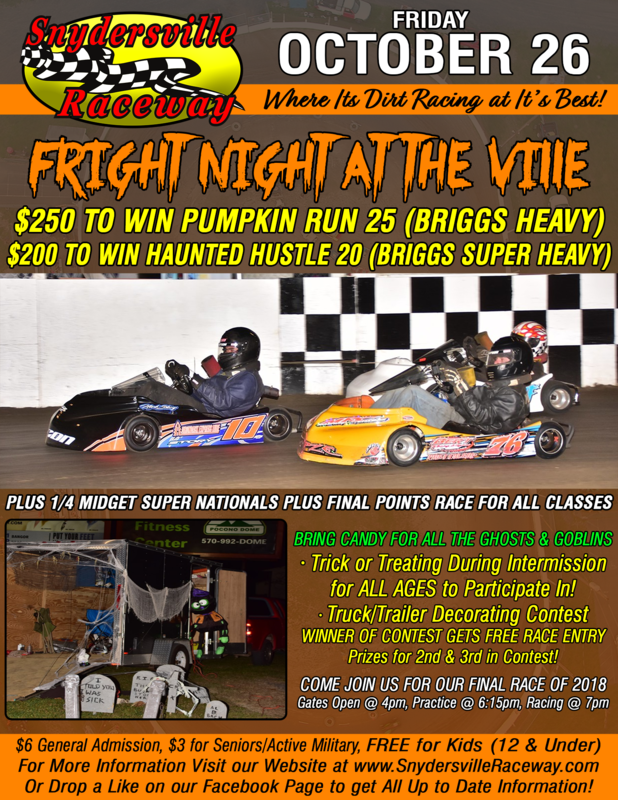 The 6th Annual Fright Night at The Ville is going to cap off the 2018 season this Friday, October 26 with All Weekly Divisions of Karts, Champs, Microstocks, and Slingshots plus there is a $250 to win Briggs Stock Heavy Pumpkin Run 25 and a $200 to win Haunted Hustle 20 for the Briggs Super Heavy division, & The Wing 1/4 Midget Super Dirt Nationals! Plus Trick or Treating during Intermission & Truck/Trailer Decorating Contest! Everyone in the Pits is encouraged to decorate their trailers or what they bring their karts in! Best appearing truck/trailer will receive a FREE RACE ENTRY & PIT PASS along with Prizes for 2nd & 3rd Best in the Contest! Everyone is encouraged to bring along costumes & dress for the occasion. Trick or Treat will occur during Intermission FOR ALL AGES. People from Grandstand will be permitted to enter the pits during intermission! PLEASE BRING TREATS FOR THE GHOSTS & GOBLINS THAT WILL HAUNT SNYDERSVILLE! See you all at The Ville!!! -Wing is Optional to Run! -RACEIVERS ARE MANDATORY FOR 1/4 MIDGETS ONLY: Please make sure you have your Raceiever to help with lining up the kids. Channel will be 454.000MHz! Thank you! • Friday, October 26: FRIGHT NIGHT AT THE VILLE: Regular Show (Final Points Show) plus a $250 to win Pumpkin Run 25 (Briggs Stock Heavy) & $200 to win Halloween Hustle 20 (Briggs Super Heavy). Plus Winged 1/4 Midgets, Trick or Treating & Trailer Decorating Contest. • Saturday, December 8: 2018 Snydersville Raceway Awards Banquet @ The Kunkletown Volunteer Fire Company.